It was less than ideal dinner experience. The food took over an hour to come after ordering and they forgot about the drink order and we never got it. They seemed unorganized and terribly coordinated with the kitchen and bar. The food was okay-halibut crudo was chewy as the steak and we were all disappointed with the overall quality of service and food. I don’t think we’ll be returning any time soon. I came here for dinner and had their pork chop. It was a generous portion but the flavor was only okay and there was nothing special about it. It came with a slice of spoon bread which also was only okay and a dollop of tart applesauce. The very crispy Brussels sprouts were good but a bit oversalted. You have to pay an extra $6 for bread, which was an outrage, but the sesame bread and butter we got were excellent. I was especially disappointed with their selection of desserts. 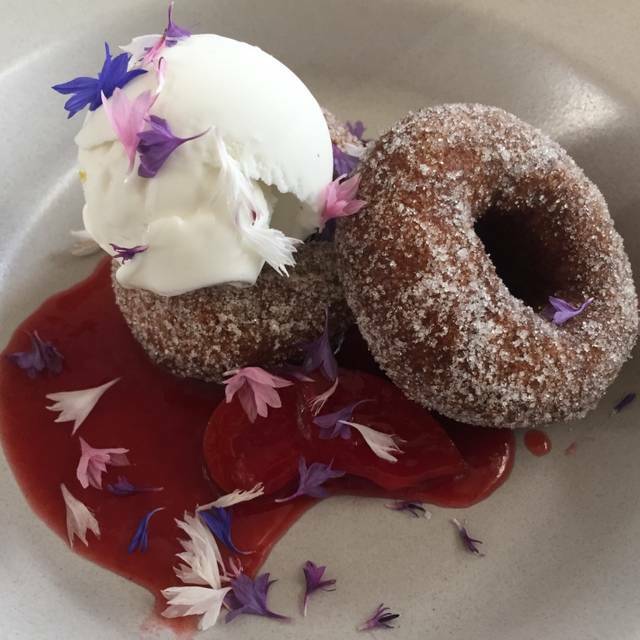 There were no pastries on the menu so we just skipped it. Perhaps brunch or lunch is better but I wouldn't recommend coming here for dinner. very good food but not very attentive service. It seems to be managed like a cafe, but with prices of fine dining! We were so surprised by the lack of customer service. Our waiter Jacob & manager on that night could not care one bit about the customers. One of our guests had to send her meal back because it was so hot. Nothing on the menu stated that it was spicey. Took 20 minutes to get him to address it, then another 20 to bring her a side of veggies to replace her meal. No apologies, nothing... Good luck Tartine. There were a lot of empty tables for a Saturday night. I guess there is a reason. Great ambiance. Not so great service or food. Not a dealbreaker in regard to the service as it was adequate. Yea we waited a while after being seated. And yea the server spent most of her time gazing out the window. But she was funny. The food though. Really salty. That's all I remember. Tartine was very nice. The food was good. The table was very small. Our wait staff was solicitous and prompt. I enjoyed it. I was simply not overly impressed. I felt the experience did not measure up to the hype. We went for dinner and the ambience, service and wine were great/delicious - the pasta dish was lovely, but the pork was a bit tough/lacked flavour. I was very disappointed with the food. It was just ok. I had the deconstructed Cesar salad. It was really bland. Probably just substandard ingredients. Then I had the pork chop. Again just on taste and poor presentation. Generally speaking Tartine is one of the best bakers in the world. It’s very hard to be the best in more than one category. So far they are not succeeding. 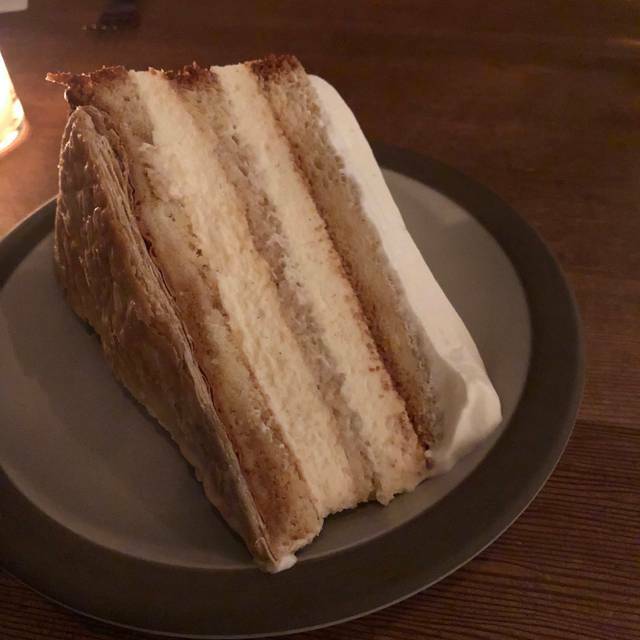 Tartine Manuf has become one of our go to restaurants when in SF. Great for lunch/brunch and dinner. If your diet leans towards vegetarian, it's a great place to indulge in some creative light entrees and delectable appetizers. 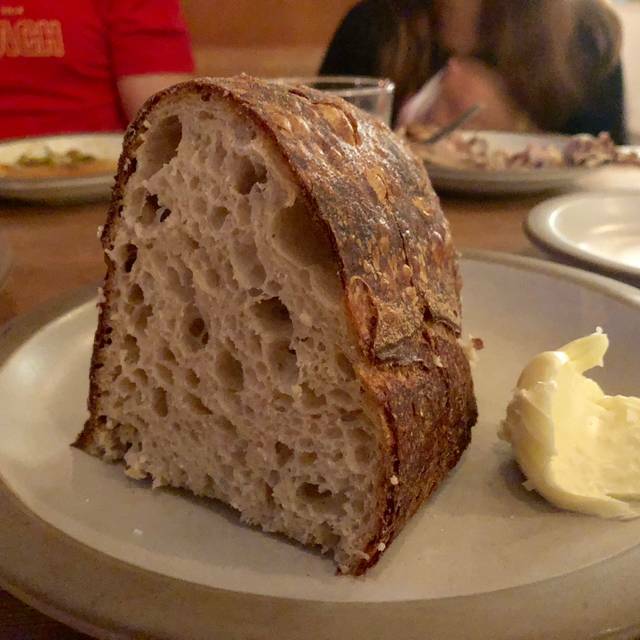 Bonus is Tartine bread, we think is some of the best in the Bay Area, which means their various toasts and tartines are amazing using their breads. Also the bar should be mentioned for excellent signature cocktails, and many other standards. Highly recommend. 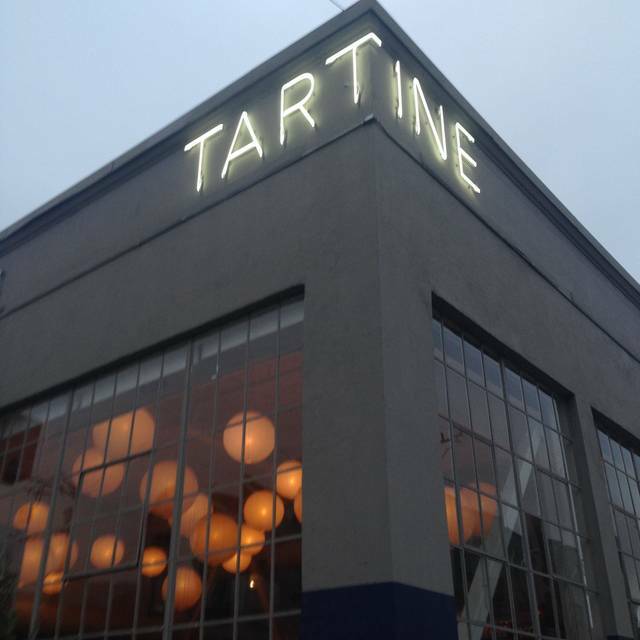 It was my second time eating at Tartine Manufactory and unfortunately it didn't live up to the first visit. We were given a burnt, cold piece of their famous bread. Our waitress could have cared less about our experience. Thankfully the kale margarita and hamachi were exceptional! Nice, open, friendly at atmosphere. 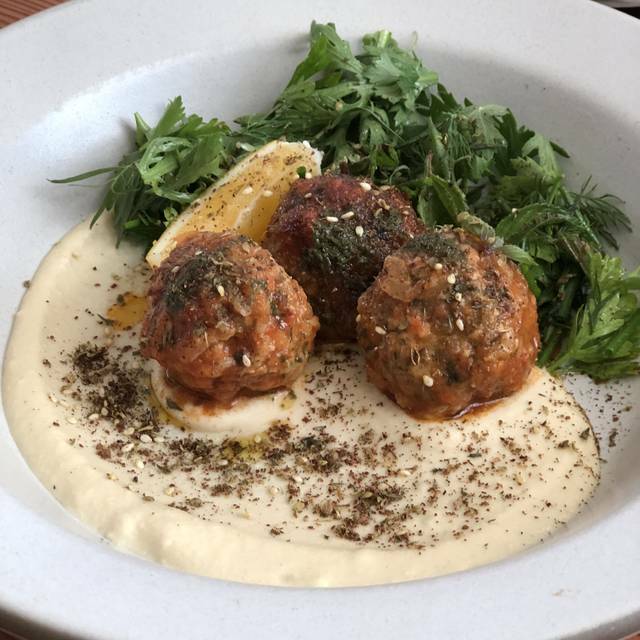 Interesting food, like the small plates to share. Great service. My friend was given a small amount of wine in a big glass. It is not a good idea to be both expensive and stingy. Be either one or the other. Would prefer to go just for breakfast lunch next time, as the bread was really the star. Great service but unfortunately packed up our leftovers incorrectly which was a bit of a bummer. Excellent service and atmosphere! Went to celebrate a birthday but was disappointed by the service right from the start. Two of the six dishes we ordered didn't have much flavor at all. The other dishes were very tasty. Portions were very small. The noise level made visiting challenging. Glad we tried it, don't think I would return. Our waiter was bad, he paid 0 attention to us and was almost as if doing us a favor in serving us. Not what you expect of a relatively pricey restaurant. Modern place in an unexpected location. Parking unexpectedly easy at 6pm. Nice variety of small dishes, with excellent ingredients and well presented, reservations were needed for table seating, but that may have been due to an event at the Z-space nearby. Waited over 30 minutes to be sat. Waited another 30 to place our food order. Person who helped us order wine had no idea and recommended a skunked wine. Really disappointing. My food main course Order got wrong. Never came, finally cancelled. Only had salad which was good and too much wine while waiting for the order that never came. Should be on the house. Chicken way to salty. Didn’t have the famous bread but food and service really gone downhill in the year since we’ve been there. Too successful for its own good. Most everything was great. The host, when asked to switch from a booth to a seated table as my wife is pregnant, seemed quite put out despite the fact that it was 5pm and the restaurant was not busy at that point. His attitude was my only issue. Other than that, our server was very nice, food was good, and we had a great time. Beautiful space, terrific new cocktail menu which was the highlight for us over the meal. Everything we had was good, though not impressive. always fantastic, one of the best spots in the city. Great food, service, and ambiance. Highly recommend it. Also, the cocktails are phenomenal! Service was excellent friendly staff. Burrata was delicious as was the margarita. I liked the relaxed feeling of the space . I thought the prices were quite high . We loved the diverse flavors and warm ambience. Note: as first-timers, we had difficulty locating the main entrance. 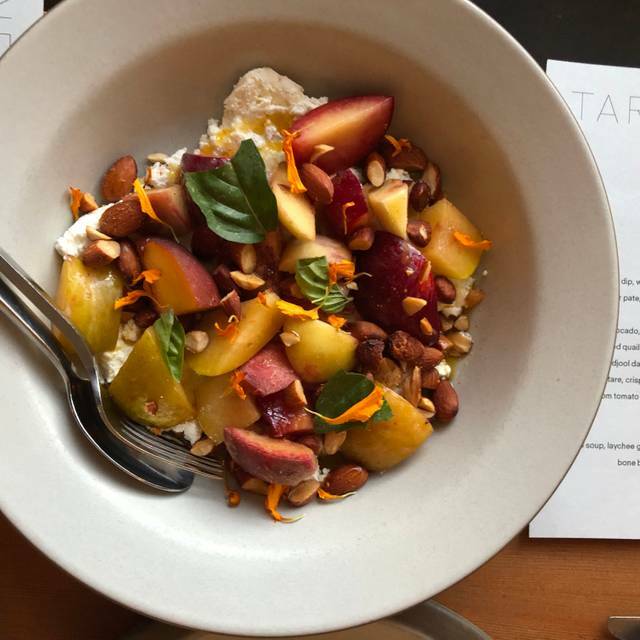 The food and service is always amazing at Tartine Manufactory. I love the way their menu changes seasonally. In the past our service on several occasions has not been good, so I am happy to say that our service of everyone from the greeter to our server was great! A limited dinner menu of interesting items. The pork chop sad to say was 50% fat, other items were very tasty. A little on the pricey side, $150 for two..not sure how we got there! I do love their bread though, especially the Danish Rye. 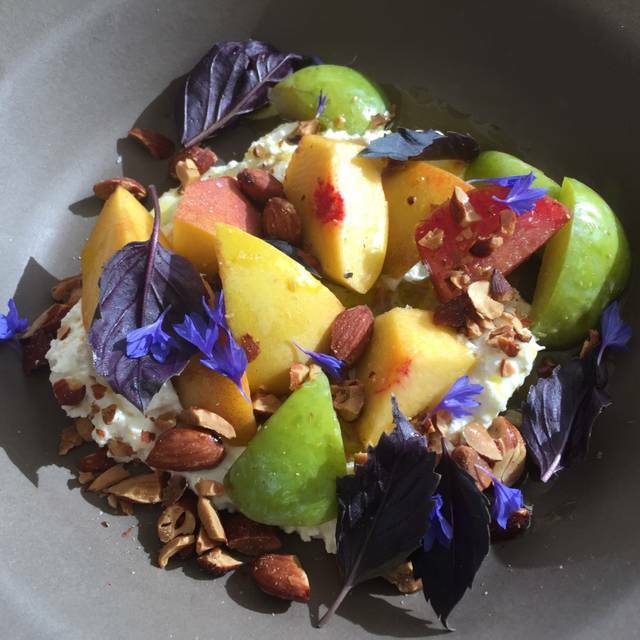 Food and experience was terrific, service a bit slow for an early dinner time experience. Was a really nice ambiance, server was great, food was great! Would definitely visit again next time I’m in SF. Wonderful! Excellent food and service! We came for a 21st birthday dinner and our server was great! Highly recommend country bread and butter, something collins cocktail, and the steak. Honestly so great and highly recommend!! 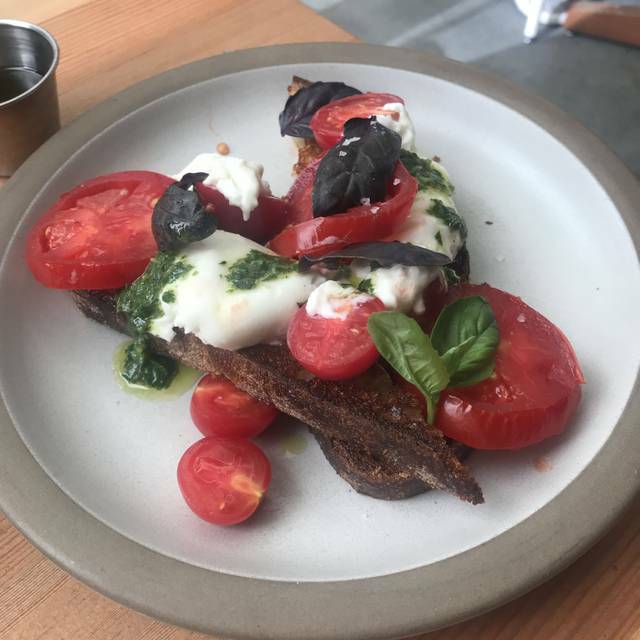 I've loved Tartine ever since I lived across the street from the bakery in college. 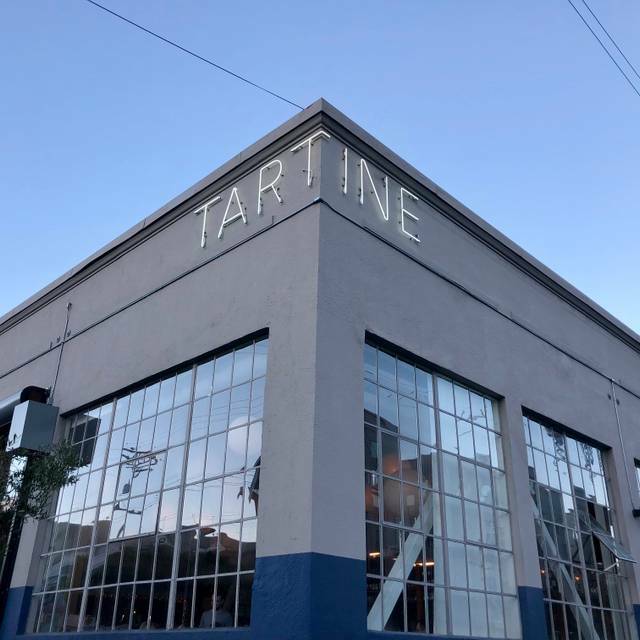 Tartine Manufactory seems like the perfect parallel to my own growth and maturation. I love the style/ambience/aesthetic and the food is always so, so good. Great creative tastes to my tongue, loved it. Not a bad dinner, but appetizers were much better than entrees and price point was a bit high for the portions.